"This painting reminds me of the first line of that great Gershwin song. These cows embody the phrase . . . 'and the livin' is easy.' 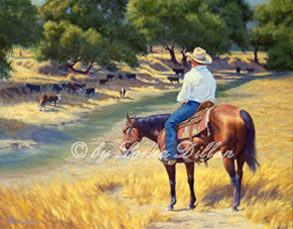 It's a hot summer day in Parkfield and they have a creek with plenty of fresh, cooling water and lots of feed to eat." "